BeFrugal.com is one of my favorite online portals. It is very reliable and clear about cash back rules for each retailer. It has over 4000 retailers including some gift card exchange sites such as Cardpool, CardCash, and Raise.com. I have been earning 2% cash back on the purchases of gift cards from them without any problems, but one day I didn’t receive one from Cardpool. Apparently, I reached the limit. Here is the rule of cash back from Cardpool. I had bought a lot of gift cards from Cardpool before I knew of BeFrugal.com. I haven’t earned the full cash back ($20 to $40) on the total purchases of $1000, but it stopped giving cash back. That means it doesn’t matter if you earned the full cash back, once the total purchases from Cardpool hit $1000, you won’t get cash back from them anymore. I carried out an experiment: If I open a new account at Cardpool.com, will I get cash back on the purchase of another $1000? I use a different email address and set a password. That’ it. And then I bought some gift cards from Cardpool through a link of BeFrugal.com. I can’t change my address. I even used the same payment method. Success! It is still pending, but cash back showed up in my account. CardCash.com has the same rule for cash back. Once it hit the total purchases of $1000, I will open a new account and see if cash back is available on another purchase of $1000. Raise.com doesn’t have a description about the limit. So, probably cash back from Raise is unlimited. All you need is a different email address. In this way, you can practically earn unlimited cash back from Cardpool and CardCash. I usually use Gift Card Granny to search discounted gift cards. In Gift Card Granny, you don’t see “CardCash.com” as a seller or buyer, but you see “ABC Gift Cards” instead. ABC Gift Cards and CardCash are both online gift card exchange marketplace, and it seems they are the same company. A gift card that is for sale at ABC is also for sale at CardCash. When you add one card to the cart of ABC, the card will disappear at CardCash, or vise verse. The prices of cards are also the same whether you buy or sell a gift card. They are the same company. And they share an inventory. It is just they have 2 different web sites. There is a big difference between two web sites for those who buy gift cards from them. 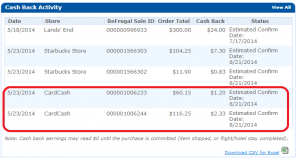 Because BeFrugal.com offer 2% cash back on the purchase at ONLY CardCash.com. BeFrugal.com is very reputable and reliable online shopping portal. You don’t need to be a credit card holder to use the site. It is free to become a member, you can start earning cash back from Day 1. It has over 4000 merchants and lots of online coupons of each merchant. Cash back info appears on the same day of the purchase, and cash back will be available for you to request after 90 days of the purchase. Plus, CardCash accepts PayPal as a payment. 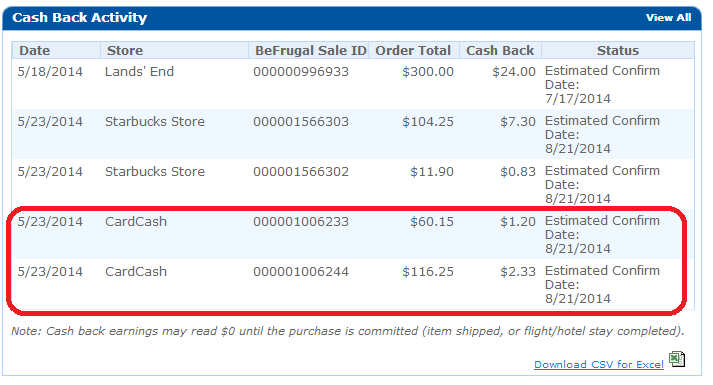 So, using PayPal Extras MasterCard give you 2X points (1.66% cash back) in addition to cash back from BeFrugal.com. It is just like eBay. eBay accepts PayPal and gives 2% back as eBay Bucks. Neither Cardpool or Raise accept PayPal, so you can’t get 2X point. All you have to do is to know – to know ABC has an identical site, CardCash and Befrugal.com offer 2% cash back on the purchase at CardCash. This is great. You do not only get discounted gift cards, but also get cash back on the purchase of them! !